Jeffrey Wigand was a central witness in the lawsuits filed by Mississippi and 49 other states against the tobacco industry which eventually were settled for 246 billion. Wigand, former head of research and development and a corporate officer at Brown and Williamson, was a top scientist, the ultimate insider. No one like him had ever gone public before. Meanwhile, Lowell Bergman, investigative reporter and "60 Minutes" producer, mostly for Mike Wallace segments, arranged a legal defense team for Wigand and taped the famous Wallace interview with its devastating testimony. However, before the most newsworthy "60 Minutes" segment in years could air, Bergman would lose to a CBS corporate decision to kill it and would experience breakdown and bitter divisions within "60 Minutes." Wigand would find himself sued, targeted in a national smear campaign, divorced and facing possible incarceration. Wigand, having wagered so much and now unable to deliver his testimony to the American people, and Bergman, trying to defeat the smear campaign and force CBS to air the interview, are two ordinary people in extraordinary circumstances. They find themselves in a fight from which no one will emerge as he entered and nothing will be the same again. Download The Insider in Digital HD from the iTunes store. The Insider images are © Touchstone Pictures. All Rights Reserved. 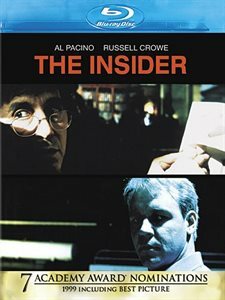 Drama at its best, The Insider takes a look at big tobacco and comes up a winner in nearly every category including, acting, directing, writing and cinematography. Now on Blu-ray for the first time, the 1999 film earned 7 Oscar nominations and accolades from nearly every film critics association. The story centers on the tobacco industry working its drama with three key players, Dr. Jeffrey Wigand (Russell Crowe) Research Vice President of Brown and Williamson, Veteran TV Producer Lowell Bergman (Al Pacino) and Mike Wallace (Christopher Plummer) a reporter for the television news show "60 Minutes". The characters all come together over accusations made by Wigand that cigarette tobacco is being manipulated to increase the addiction of smokers. Wigand has been fired from his managerial duties at B&W Tobacco. Distressed by the bogus reason for his dismissal, he makes it known that he wants to blow the whistle on his former employers. Producer Bergman wants to further his career with a big story for "60 Minutes" and ferrets out that Wigand has a lot to say about the controversial issue of cigarette smoking and health. B&W gets wind of Wigand's wishes to go public and tries to stop him legally and through coercion. Bergman coaxes Wigand to let the world know what is going on by being interviewed by Mike Wallace. Bergman succeeds in getting the show taped, but with a stock sale of CBS Corp to Westinghouse and the loss of cigarette revenue staring the network down, the interview doesn't get aired. Now caught in between a rock and a hard spot, Wigand must find a way out, while Bergman fights to get his show on the air. 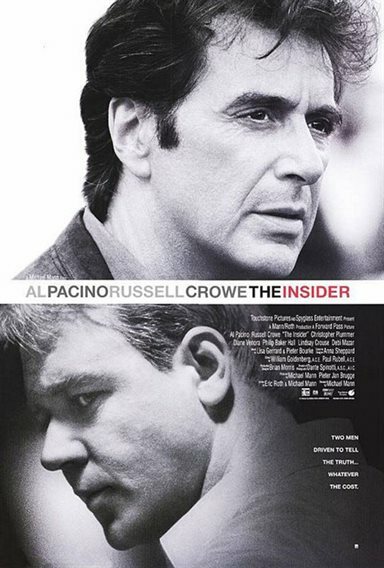 Under Michael Mann the acting of Pacino, Crowe and Plummer gets emotional and very poignant. The three consummate actors are on the top of their game and bring out the best in this character driven story. Mann puts the players through very distressing situations, tense moments, scary challenges and he comes up a winner on all counts. He laces his film with familiar faces like Phillip Baker Hall (Argo) as Don Hewitt creator of "60 Minutes" and Colm Feore (Chicago) as Attorney Richard Scruggs who is on the team that's suing Big Tobacco and Michael Gambon (Harry Potter) playing Brown and Williamson CEO Thomas Sandefur. The film should have taken Best Picture at the Oscars, but although being nominated for the honor was out shined by American Beauty. The video quality of the Blu-ray gets high grades for clarity showing no grain or distortion. The 1080p widescreen presentation in High Definition puts you right into the story and helps to hold your attention through the two and a half hour dramatic thriller. Shown on my HD television you could see the sweat and tears of the actors. The audio came across no better than most videos, especially since most of the dialogue come from the front speakers anyway. In some instances you can hear side chatter, deep tones cutting in and out and the music circling. Played in 5.1 DTS-HD through my home entertainment speaker system and especially since there's no need for special effects or an explosion, the sound quality's never lost. I did hear the ping of clubs hitting golf balls during the tense driving range scene. The special extras are few and include "Production Featurette with audio commentary by Al Pacino and Russell Crowe" but it's only good if you didn't get enough of the two from the film itself.